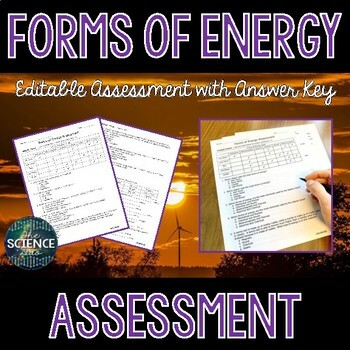 This Forms of Energy Science Assessment will help to support important science content while offering an effective summative assessment for your students. 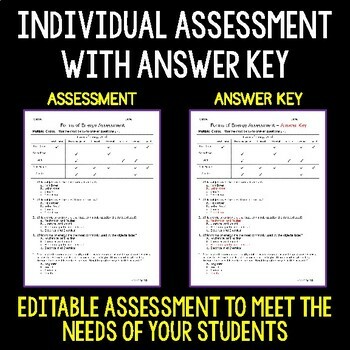 This resource comes with a fully editable pre-made 33 question assessment and 2 versions of the answer key - complete and quick check formats. 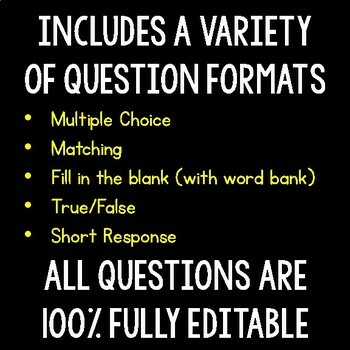 A variety of question formats are included - multiple choice, matching, fill in the blank, true/false, and short response. 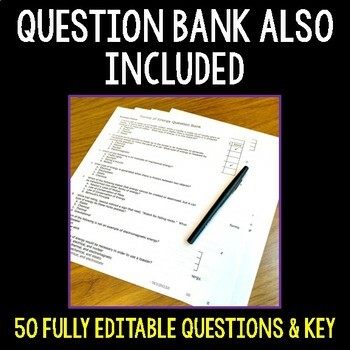 Also included in this resource is a question bank containing 50 editable questions and answers (33 of these are contained in the pre-made assessment). You are free to add, remove, or modify any of the questions to fit your needs. Check out the preview for more details! 1. Use as quiz, assessment, or checkpoint. 2. Use to reinforce key science concepts. 5. Use in small groups, pullouts, or tutorials. 6. Use as a homework assignment. © Copyright The Science Duo. All rights reserved by author. This product is to be used by the original purchaser only. Copying for more than one teacher or classroom, or for an entire department, school, or school system is prohibited. This product may not be distributed or displayed digitally for public view, uploaded to school or district websites, distributed via email, or submitted to file sharing sites such as Amazon Inspire. Failure to comply is a copyright infringement and a violation of the Digital Millennium Copyright Act (DMCA). Intended for single classroom and personal use only.